The Tabata interval is 20 seconds of work followed by 10 seconds of rest for 8 intervals. Tabata score is the least number of reps performed in any of the eight intervals. Unit for the row is “calories”. 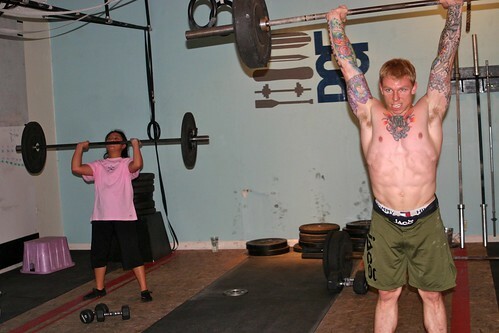 CrossFit can be an intimidating prospect for many people. The first video you watch is a bunch of ripped people, performing ungodly tasks, most likely with an insane amount of pullups. You may start to peruse through some of the workouts, looking for something reasonable, but to no avail. I can sense you lurking out there, wondering and wanting to begin your journey. Have no fear, just walk in the door. Don’t fool yourself that you need to get in shape before you start CrossFit! If you are reading this and want to get started, find your local affiliate. If you are a member already and you know someone that is intersted in joining, let them know your story. Everyone has to start somewhere.